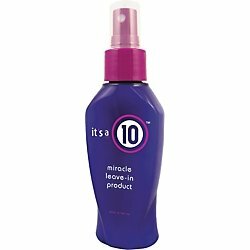 Its A 10 Miracle Leave-In Product - 120ml/4oz - ITS A 10 Review! I absolutely love this stuff! I actually got a free bottle of it with a coupon I had thru Ulta and fell in love. There is seriously nothing better to get the tangles out and give your hair that sleek shine. And the smell is ahhhhhmazing! It doesn't leave an oily residue and my daughter and I both use on a daily basis. I just spray in my hair before blow drying. I have tried so many leave in conditioners and this is by far my fav! It's a little pricey but not to bad. Walmart I believe for around $18 for almost 5 oz. but if you have a $3.50 off to Ulta it would be even cheaper or even ordering online. I love this as well! I have very long hair and mine always get tangled really bad. This stuff works miracles! @cierrafarnsworth I agree!!! My little girl has curly hair and thus works magic on her hair and saves lots of time trying to get knots out. I never heard of this brand before. Bet it smells good.